What are the security measures that should be taken while using cheques? One should never pre-sign blank cheques. Please remember that a cash cheque can be cashed by the bearer, whether they are the person the cheque is intended for or not, keep your cheque book(s) in a safe place. Always keep a record of the cheque paid out to in terms of amount, date and payee written in the section provided in your chequebook. Reconcile your bank statement from time to time to ensure the cheques and amounts written by you match what appears on your statement. As an alternative to paper cheques you may also want to consider electronic payment options from your Bank if available. 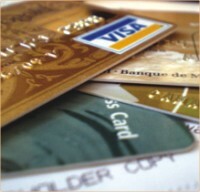 While using credit cards, what are the things we should remember? One should never share, write down or disclose Credit Card number or the PIN, access codes or passwords to anyone, or store them in a file in the computer. Always sign your new Credit Card as soon as you receive it. Destroy and dispose of old documents that display your credit card number such as airline tickets or receipts. Never email credit card or bank account details. Don't choose a PIN that is easily associated with your birth date, phone number, or parts of your card number. Dispose of expired cards by cutting it in half, never let anyone else use your card and most importantly if you lose your Credit Card please contact your Bank or the issuing company immediately. What minimal measures need to be taken while in possession of an ATM card? Never share, write down or disclose your PIN to anyone, always sign your new ATM card as soon as you receive it, don't choose a PIN that is easily associated with your birth date, phone number, or parts of your card number, always put cash into your pocket or wallet before walking away from the ATM machine, always remember to take your ATM card back after using it, always keep your ATM card in a safe place. If you lose your ATM card please contact your Bank immediately. What are some Telephone Banking security measures to take note off? Please do not share, write down or disclose your access codes or passwords to anyone, other than for signing in procedure in the presence of an authorized individual, do not store them in a file in your computer. Banks usually will not ask you to disclose your phone banking password online or over the phone, never give your credit card and bank account details to someone you don't know over the phone. When travelling overseas there are a number of things you should remember regarding security. Please do not leave travel documents, traveller's cheques and credit cards unattended, wherever possible use safety deposit boxes or safes to store these items rather than leaving them in your suitcase or room. Travellers cheques are a safe alternative to carrying large amounts of foreign cash. For better safety you may also consider using your foreign currency credit card for making payments while you're overseas. I am a 25 years old female. I have noticed some dark spots on both my cheeks and on the top of my nose for the last 4 years. They are very tiny and brown in colour. I have tried many types of treatments but nothing seems to make them go away. Now, whenever I look at myself I feel very frustrated. Can you help me? Well, many kinds of pigmentation occur on the face, mainly they are due to sun exposure and will increase with more exposure. So for the first step of treatment you should avoid sun exposure and use a sunscreen preferably one with SPF above 30. If what you have are freckles then treatment by CO2 laser will help you. If it is some other kind of pigmentation then Q-switch laser may help. First, a proper diagnosis has to be made and then treatment should be planned. I have been suffering from a cough for the last few months. I have taken a course of antibiotics as well as cough syrups, but the cough didn't go away completely. It has now become dry and irritates my throat a lot. Its very distressing as sometimes it starts when I am talking and won't stop for a while. What can I do? You should definitely consult a doctor. You may be allergic and should try to find if any particular thing triggers the cough. Also you may have a chronic throat infection, which might be the cause and needs to be treated. Chronic sinusitis can also cause this kind of cough. There are many other reasons for chronic cough. You should not take it lightly and consult a doctor as soon as possible. I have a swelling on my cheek, which gets big at times and shrinks at times. If I squeeze it some whitish material comes out of it. So long, I was not worried as it used to get very small, but now I notice it is getting bigger. What should I do? I talked to a doctor who said that it may have to be operated on. If so, will there be a scar? First we need to see what it is. By your description it sounds like a sebaceous cyst if so then you need to get it removed. You will have a very faint linear scar if, the excision is done by an experienced surgeon. These scars become faint over a period of time. Some moments in our lives are more defining than others, and my week in Dhaka was perhaps one of those times, or perhaps it wasn't… now looking back it seems like it might have been a dream. The thing about the word “dream” is it's always associated with happiness, hope, but I would like to clarify when I use the word dream here, it's more realistic, it's about your average everyday dreams. Yes, there are magical elements but there are also disappointments, sadness, strange happenings, a feeling of gain and loss, and my one-week ago visit to Dhaka seems like one of those dreams. Sitting here in my comfortable couch under dimmed lights all over my living room I feel at peace. I have shed a few pounds in Dhaka which always makes me happy, the humidity, the constant running around, the bumpy roads and even bumpier yet such fulfilling rickshaw rides slim me out. The new nose ring I found is now glowing brightly on the left side of my face. I feel happy, content and I wonder how much of this happiness is from the lingering good feeling that Dhaka created. I closed my eyes all right, all the way to London where we waited in the runway for half an hour and I missed my connecting flight. But you know what, I will stop here with the negativity, it's all good now, I survived yet another flight to Bangladesh, just so I can look back at my realistic dream. But how was Dhaka? I ask myself, and I don't feel like answering just with a good or bad because it was really not that simple. The Dhaka I visited has grown more complex, has become emptier, there is too much air in some places and none at others- people are breathing too much oxygen or dying from complete suffocation. I didn't have to experience both, it would take more than a week to experience both, and it will take me more than one column of “Under a Different Sky” to explain how Dhaka was. Skimmed milk may be better at quenching your thirst after a strenuous workout or a run. Two studies have shown that it's better at stopping dehydration than either water or specialist sports drinks. And that's not all: 'Milk is an excellent natural source of energy, protein and a vast array of vitamins and minerals essential to good health,' says Dr Judith Bryans, director of The Dairy Council.